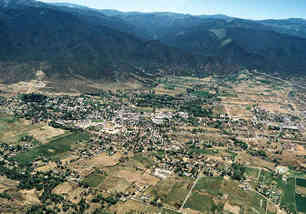 Astronaut candidate teams (the Penguins) acquired 18.5 km of gravity data during a planetary exploration simulation cooperatively conducted by JSC/NASA and the New Mexico Bureau of Geology and Mineral Resources (NMBGMR), a division of New Mexico Tech, in Taos, New Mexico during the summer of 1999. The geophysical exercise and a geological field trip in the region are elements of the Earth sciences and remote sensing training provided to astronaut candidates by Office of Earth Sciences at JSC. 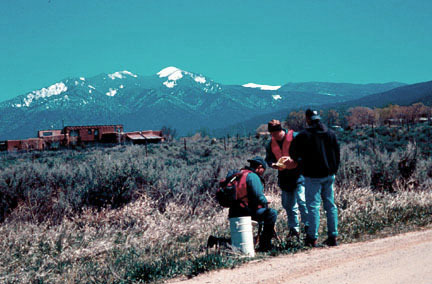 The exercise served two purposes: 1) To train astronaut candidates in geological/geophysical field exploration techniques with direct relevance for lunar and planetary exploration; and, 2) To assist in the delineation of subsurface faults, as part of an ongoing NMBGMR hydrogeologic assessment of the Taos Valley. Both of those goals were met and surpassed. Hans Schlegel (kneeling) and Clay Anderson measure gravity under the supervision of Tony Lupo. The Taos Range is in the background. Thirty-one members of the 1998 astronaut candidate class are now experienced in collecting gravity data to define buried faults in the context of a ground-water investigation. All readily mastered the technique and recognized the potential of the method for planetary exploration  particularly of Mars, where windblown sand covers a highly varied landscape. The recent discovery of relatively young Martian landforms (also see Science v.288, p. 2330-2335--pdf version), which suggest that liquid water exists at shallow depths, raises the possibility that geophysical surveys might help characterize Martian subsurface hydrogeology. Also, the 1999 discovery of magnetic stripes on Mars, perhaps analogous to those that record seafloor rifting on Earth, suggests that gravity surveys could reveal significant buried Martian structures. One or more of the Penguins astronauts may step on Earth's Moon or Mars, but most will help direct those missions from Earth. They will know at least one investigative technique, they will have helped plan a geophysical traverse, and they will have a sense of the time required for scientifically rigorous planetary exploration. Future geological training will build upon this experience and address varied scientific objectives, as candidate sites for lunar and Martian exploration are selected. Successful human missions to the planets and the Moon arise from a vigorous exploration culture on Earth. Long before launch, explorers will require the commitment, support, and understanding of their coworkers. The Taos training program was the first step towards instructing astronaut explorers in geophysical methods appropriate for planetary exploration, and a substantive step toward building an exploration culture within and beyond NASA. As a result of the Bureau of Geology contribution to astronaut training, NASA awarded the Bureau of Geology its coveted Lyndon B. Johnson Space Center Group Achievement Award in a surprise presentation at the spring meeting of the New Mexico Geological Society. The award, presented by geologist astronaut Jim Reilly, was announce in a NM Tech press release and picked up by several newspapers in New Mexico and Colorado.